Many of these take the form of well-rehearsed identities (e.g.spiritual identities, cynical attitudes, attack of coach or method, sudden shift of priorities) that are designed to ‘protect’the coachee from the suspected pain of re-owning deeper lying disassociated parts (shadows). These defence mechanisms can easily sabotage the transformative process. In many cases, the coachee is not aware of these phenomena, but rather strongly identified with them. 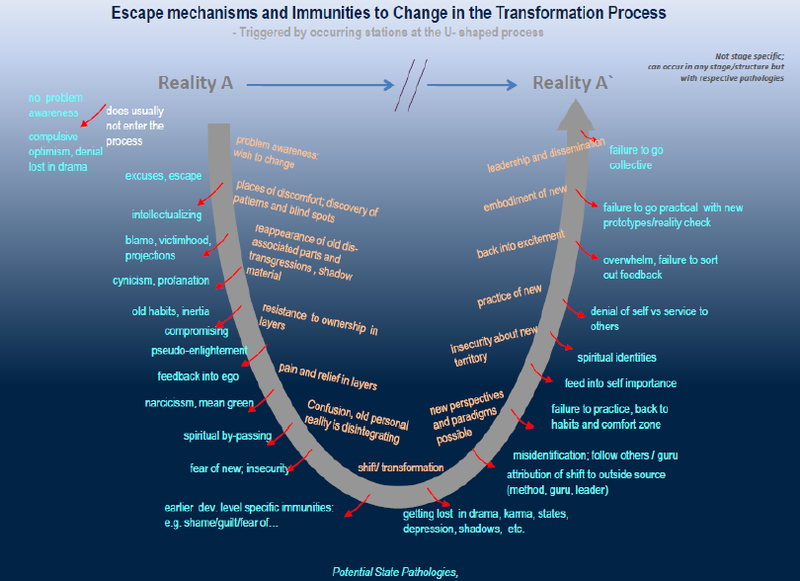 Kegan and Lahey (2009) define this as “Immunity to Change”, a “hidden commitment”, with an underlying root cause, that competes and conflicts with a stated commitment to change. It is these hidden commitments that cause people to not change and to fail to realise their best intentions. It takes experience to spot such phenomena and to defuse or utilize any deviating construct arising in the space appropriately, in real time. Based on more than a decade of practical experience with coaching transformational change processes in adult development, combined with the application of integral theory on facilitating change in personal to global strategic projects, I have started to map out recognizable patterns that show up consistently as indicators of specific stages of the transformation process in individuals and groups. Resistance patterns or pathologies can of course vary in flavour and form depending on the kosmic address or altitude of the group or person in the process. If level-specific mechanisms show up, they are best addressed with tools and approaches that correspond well with that specific developmental level. Escape patterns and pathologies in different states of consciousness are harder to recognize and require, as always the full experience and presence of the coach. These diagrams are intended to provide hands-on practical information that is hopefully useful to practitioners dealing with transformational change. I have listed a number of tools and methods that have proven appropriate and extremely useful in coaching people back on track in their movement through transformational processes. In transformation work we encounter a lot of fear and collective shadow around resistance and blocks, not just in the coachees, but also with some coaches and trainers. These tensions can and should be harvested. It requires some cleaning up and practice, like mental aikido training, to recognize obstructing, attacking or resisting forces as forces to work with and as pointers and key indicators to the most important acupuncture points for change, much like a treasure map. Furthermore, if the transformational process is designed to prototype new ideas, listening to the information sitting on resistances and fears can actually provide the breakthrough that is called for. Then, working with resistances can even be like a fun ride in a roller coaster or like a ride on a sail boat using the resistance to propel you in the direction of your conscious choice. Welcome to the world of trim tabs. This is a good article, I shared it out on Twitter and I will send it to some of my clients. This is a nice article on applying Integral Theory to resistance. This is something that is universal in organizations and individuals.